In Drupal 7 if you wanted to activate a block, say the recent comments block, you would select the dropdown next to it and select the region where it's supposed to be displayed. So let's say we wanted it in our first sidebar. I'd select sidebar first, it would shift it up to that sidebar and then I would click save blocks. 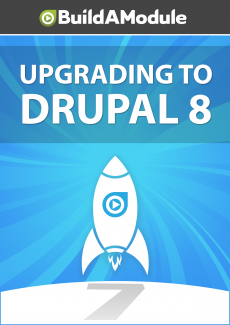 Now there's a couple user experience problems with that whole process that had been fixed in Drupal 8. Let's duplicate that process here. So I'm going to scroll down to our sidebar first, which is right here. So first I'm navigating to where I want to put the block instead of trying to navigate to the block, and then I'll click place block, which is a lot more intuitive than figuring out what that select box is for. Here I can filter the blocks, so even if we have hundreds of blocks available we can filter it down to a handful with just a couple of keyboard strokes, but I can see it right here, recent comments. I'm going to go ahead and click place block. At this point I get to adjust the settings, which is something that I didn't get to do in the Drupal 7 workflow. If I wanted to adjust the settings I'd have to go and click configure right after I placed it. The configuration has been simplified a bit.